◆- Detects the latest pop mode radar gun (super-fast instant on mode) . ◆- Relative speed sensing auto mute system that virtually eliminates false alerts. ◆- Relative speed sensing auto shutdown feature will render your detector undetectable by currently available radar detector-detectors. ◆- Provides complete immunity to VG-2 radar detector-detectors. ◆- Electronically remembers radar detector setting for an indefinite period of time even with the power removed. ◆- "UP": Volume will be increased pressing this button. ◆- "MENU": Shift between the city mode and high way mode, it will change language to Russia or English if press this button over 5 secouds. ◆- "DN": Volume will be reduced pressing this button. Radar Detector: Extreme Range Super heterodyne technology, with super-fast sweep circuitry, provides extra detection range and the best possible advance warning to even the fastest radar guns Detects Ku Band radar gun currently being used in Europe Extreme Range Super heterodyne technology, with super-fast sweep circuitry, provides extra detection range and the best possible advance warning to even the fastest radar guns. Radar Detector: When you detect a position, the GPS will tell you by make a sound to show you are approaching speed detection device, so you can confirms the your speed on the stretch of road.Provides complete immunity to VG-2 radar detector-detectors; Electronically remembers radar detector setting for an indefinite period of time even with the power removed. Radar Detector: Detects the latest pop mode radar gun (super-fast instant on mode) This Radar can Detect any stable or mobile Radia Speed Monitor 250-2500m ahead. 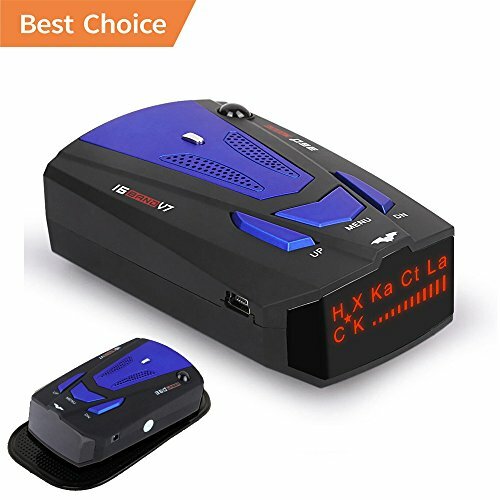 Radar Detector: Relative speed sensing auto mute system that virtually eliminates false alerts and shutdown feature will render your detector undetectable by currently available radar detector-detectors. Radar Detector: X-BAND: 10.525GHz100MHz, detectable distance: 1500-2500m K-BAND: 24.150GHz175MHz, detectable distance: 1200-2500m Trfor for iPod K-BAND: 24.150GHz175MHz, detectable distance: 250-1200m KU-BAND: 13.450GHz125MHz, detectable distance: 450-1500m KA-BAND: 34.700GHz1300MHz, detectable distance: 800-1500m Trfor for iPod KA-BAND: 33.400GHz1300MHz, detectable distance: 200600m Laser beam: 90433KMHz VG-2: 11.150GHz410MHz . If you have any questions about this product by HelloWorld, contact us by completing and submitting the form below. If you are looking for a specif part number, please include it with your message.